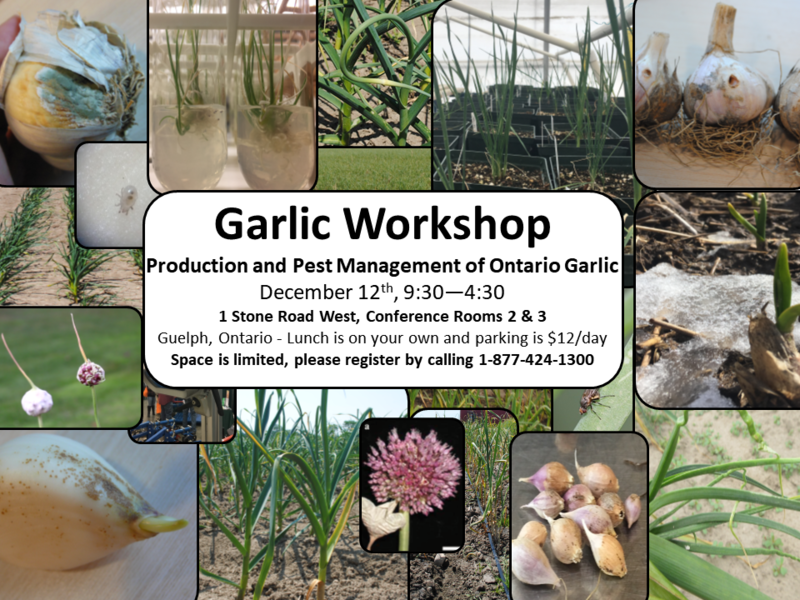 This workshop will focus on production and pest management of growing garlic in Ontario. Topics include clean seed production, cultivar selection, seeding spacing and density, soil and nutrient testing, crop insurance, weed control, pathogen and insect identification and control, leek moth and nematode management, crop rotation options, scaping techniques, upgrading equipment, bio-inoculants, cleaning, grading, curing, storage, processing, marketing as well as cost of production! The workshop takes place at 1 Stone Road in Guelph, ON, December 12th from 9:30-4:30 in conference rooms 2 & 3. If you or anyone else you know would like to attend this workshop, please register by contacting OMAFRA’s Agricultural Information Contact Centre by calling 1-877-424-1300. Space is limited so please register early. Workshop materials provided. Onsite parking is available for $12/day. Lunch is on your own. Supported by the Garlic Growers Association of Ontario. If you have questions about what will be covered, please contact Travis Cranmer at travis.cranmer@ontario.ca.